The Brain Injury Research Institute reports that high school athletes who sustain a concussion are three times more likely to sustain a second concussion, and a lack of proper diagnosis and management of concussion may result in serious long-term consequences, or risk of coma or death. Brightlamp Inc., a Purdue University-affiliated startup, has launched an application that lets a smartphone user quickly record data that can be sent to a medical trainer or other medical professional who can objectively determine if that person has sustained any neurological disturbance, including concussion, with potentially serious long-term health repercussions. 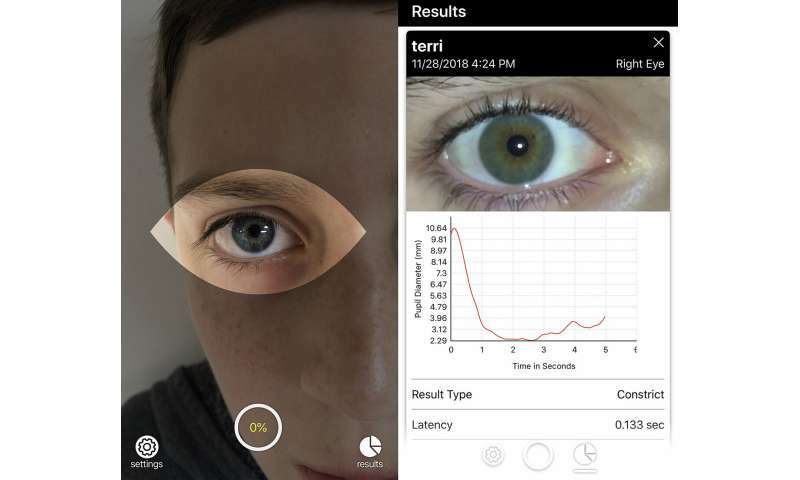 The app, called Reflex, works exactly like a pupillometer and can take a digital video recording with a smartphone of an individual's eye to measure a response called "pupillary light reflex." Basically, the user holds the camera up to an eye, taps the screen and a light flashes to initiate a response from the pupil. Reflex is a Class I regulated medical device, according to the U.S. Food and Drug Administration. The app measures the latency, constriction rate, dilation rate and other relevant metrics. Change in pupil response has been correlated with brain stem and hypothalamus injuries including blast-induced traumatic brain injuries, non-blast-induced traumatic brain injuries, neurodegenerative diseases and conditions affecting cognitive capacity. The app can be used by athletic trainers, physicians, neurologists and academic researchers to monitor cognitive functionality for many neurological disturbances, diseases and abnormalities. A concussion is a mild traumatic brain injury caused by a bump, blow or jolt to the head or body that causes the brain to move rapidly inside the skull. Diagnosing a concussion can be tricky. According to Brain Injury Research Institute, an estimated 1.6 million to 3.8 million sport- and recreation-related concussions occur in the United States each year. Revelations from former professional athletes have shown concussions have potential for long-term damages. The Centers for Disease Control and Prevention says people with traumatic brain injuries can face effects that last a few days or the rest of their lives. It says effects of TBI can include impaired thinking or memory, movement, sensation, vision hearing or emotional functioning, such as depression or personality change. The ultimate goal is to let a sports youth coach or parent to use a version of the app that can suggest there is a problem, but that would require approval from the FDA, which will take years, said Kurtis Sluss, Brightlamp's CEO. "We give them an objective tool to monitor that. That way they're not second-guessing," Sluss said. "Plus it gives them data they can reliably look back on and track progression over time." A study by researchers at Butler University released in 2018 found that duping one of the nation's most common screening tests, the Immediate Post-Concussion Assessment and Cognitive Test, or ImPACT , was significantly easier than previously measured. Sluss said Brightlamp's method can't be duped. "Our test is unbiased. It's based on natural response, so you can't beat it. It also gives direct insight into the brain," he said. Brightlamp recommends that users take a baseline test before an athletic season begins, but Sluss said it isn't necessary. "There's a normal physiological response across the human population, so we know what normal areas are," he said. Medical professionals have long used the pupillary light reflex—usually in the form of a penlight test where they shine a light into a patient's eyes—to assess severe forms of brain injury. Recent tests have shown that those tests aren't very accurate, Sluss said. A growing body of medical research has recently found that more subtle changes in pupil response can be useful in detecting milder concussions. Sluss said Brightlamp's app is better because it is more sensitive. The company has a patent on the technology.